King Kong, as character, icon and film, is one of the most recognised images in all of cinematic history. Released in 1933, it is often somewhat simplistically credited with the single-handed rescue of RKO studios from bankruptcy (1). Kong was re-released in 1947 and 1952, and has enjoyed numerous revivals since the restoration of some original scenes in 1986. In 2003 the film is of particular interest, as director Peter Jackson’s production company, WingNut Films, has announced a remake (2). The 1933 original tells the story of an adventurous movie producer, Carl Denham (Robert Armstrong), whose latest project has him preparing for a “crazy voyage” to a mysterious island. Convinced that his film needs “a pretty face” to lend a love interest, he rescues starving actress Ann Darrow (Fay Wray) from the streets. With a promise of “the thrill of a lifetime… and a long sea voyage”, Denham secures her promise to accompany him on his expedition. Chained for display in a Manhattan theatre, Kong is enraged by flash bulbs and breaks free to smash his way through the streets in search of Ann. His final battle takes place atop the Empire State Building where, riddled with bullets from circling fighter planes, he gently sets Ann down, roars one final time, and falls to his death. In one of the most famous lines in filmdom, Denham sums up the sympathetic appeal of the great monster as he stands over Kong’s body: “It wasn’t the airplanes. It was beauty that killed the beast”. Weston: Is this the moving picture ship? Dock Worker: Yeah, you goin’ on this crazy voyage? The story itself is essentially divided into three acts (New York to Skull Island, on the island, back in New York), and the pace of the film steadily increases, never giving the viewer time for reflection. An oft-described animation sequence in which some of the sailors are dropped by Kong into a ravine and then devoured by giant insects was trimmed by Cooper, who realised that such a horrific vision would place too much punctuation in the middle of a suspenseful build-up. It is this sort of attention to narrative detail that allows the story to unfold smoothly, from beginning to climax. Although Kong is “the product of many contributions” (3), the film is in several ways a reflection of the three principles in this regard: co-producers and directors Merian C. Cooper and Ernest B. Schoedsack, and chief technician and animator Willis H. O’Brien. Cooper and Schoedsack had worked together on the documentary features Grass (1925) and Chang (1927). Both had served in the war, and they were veterans of many exotic voyages like those of Denham (clearly styled after Cooper) and Driscoll (after Schoedsack, whose wife Ruth Rose had accompanied them to Africa and subsequently co-wrote the screenplay for Kong). In 1931, Cooper went to work for David O. Selznick at RKO Studios, bringing with him the vague idea for a film about a giant ape (4). Willis O’Brien – Obie to his friends – had discovered the process of stop-motion animation using articulated figures in 1915. After a brief career with Edison, he animated the prehistoric monsters for 1925’s film version of Arthur Conan Doyle’s novel, The Lost World, a hugely successful project. In 1931 he was under contract to RKO, building and animating test sequences for a film to be entitled Creation. While Creation was headed for the scrap-heap, Cooper realised that what O’Brien had already achieved with animation could be put to use making his ape film, a project that would otherwise have been technically impossible. In the right place at the right time, the principle creative figures behind Kong enjoyed a very happy accident. Just as the similarities between the producer/directors and their filmic counterparts are too obvious to ignore, those between O’Brien and his most well-known creation, Kong, are equally compelling. Although Obie and his team – including, most importantly, modeller Marcel Delgado – made extensive use of motion studies in plotting the movement of animated figures, the end result could hardly be kept from exhibiting a sense of motion natural to O’Brien himself, as the hands-on animator. 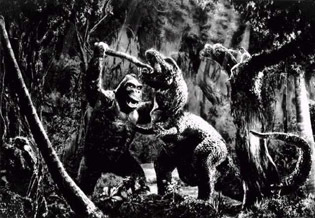 This is perhaps most notable in the fight sequence between Kong and the Tyrannosaurus in which Obie, a former boxer, depicts Kong in a fighter’s stance, pummelling the dinosaur with his fists. The effect of this “personalised” animated movement is a unique aesthetic combination, at once the work of art and the signature of the artist. In addition to the movie as a whole, the animation and photographic effects in King Kong left a legacy of their own within the film industry. It is difficult to find a special effects technician – or a director of effects-driven films – who does not list Kong as a primary influence. The techniques developed for and during the making of the film are relevant even to later technologies; the CGI dinosaurs of 1993’s Jurassic Park were originally intended to be animated in stop-motion, and the techniques originated by Willis O’Brien have been instrumental in the development of digital animation (5). As far ahead of King Kong as digital effects seem, they might not have been possible without the ingenuity of O’Brien, and the lasting influence and appeal of his greatest creation. And it is a remarkably universal appeal. An acquaintance of mine was perplexed recently when I told him that I study film. He is from the Middle East, doesn’t watch films from the West, and thought he would find my field incomprehensible. “Do you know King Kong?” I asked him. He smiled and raised his arms in imitation of the great ape: “Oh yes! I know King Kong”. Goldner and Turner (pp. 1-31) provide a detailed account of the exploits of Cooper and Schoedsack prior to 1931. See, for example, Don Shay The Making of Jurassic Park (Ballantine, New York, 1993). Shay is also the author of the definitive biographical piece on Willis O’Brien, “Willis O’Brien: Creator of the Impossible”, Cinefex 7 (January 1982).